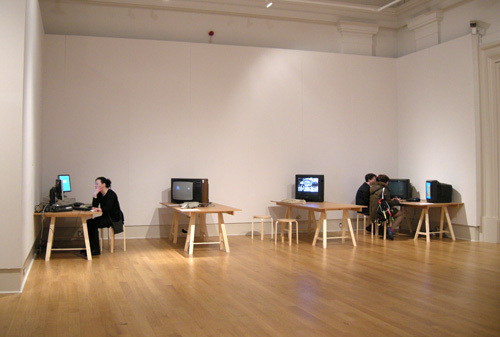 The Ministry of Rules is now in residence in The City Gallery’s Play Ground Exhibition at the New Walk Museum and Art Gallery. Sound like a lot of organisations involved? It is! However it gives us more to investigate, so we’re happy! 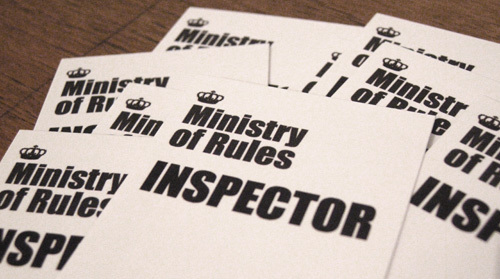 The Ministry of Rules ID cards were delivered today! Excellent! MoR ID badges - make sure you collect yours before you join in the investigations! Everyone (well, at least the first 500!) joining the MoR as an Inspector and taking part in the various activities over the half term week will get one of these ID badges to wear. We’ll be issuing different coloured lanyards for each half day – grab an extra string for your bow badge each time you take part. 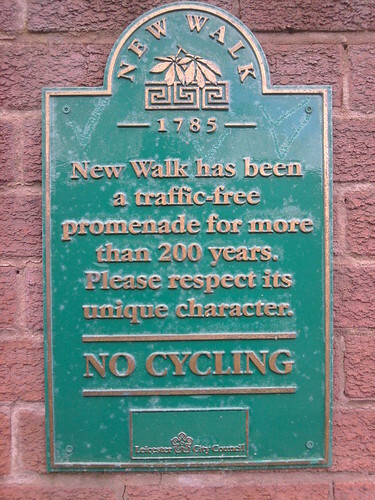 We wanted to make a find-the-sign challenge for the streets around the New Walk Museum and Gallery, but all the signs we found were about things like dog poo and drinking in the streets – frankly a bit too depressing. 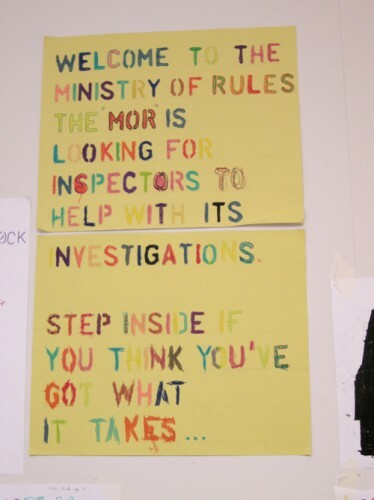 So, the Ministry of Rules is instead asking all MoR Inspectors to keep their eyes peeled for interesting signs (for instructions and rules) near them. Can you find any with quirky messages or that are made in an unusual way? Share any good ones you spot by emailing them to things87among@photos.flickr.com. Put the photo’s title in the email’s subject and any other details in the email’s message. You can read more about how to share photos with the MoR here. As far as a know the Ministry of Rules has never recruited new staff on the scale that it will do between the 21st and 25th of February. We’ve been wondering what job title all these newcomers will have. Who works for the Ministry of Rules? Lots of great angles there and thanks to everyone who contributed to a whirlwind 5 minutes of ideas bouncing! We think we’re going to go with “Inspectors” because looking and paying attention will be a very important part of the job. Yesterday the MoR went to New Walk Museum and Art Gallery to do a quick reccy on the Play Ground Exhibition. Over half term this area will be transformed into the Ministry of Rules HQ. We’ve got a large space at the end of the gallery that we can take over and use as our headquarters. Those trestle tables and the exhibits will be relocated and that massive wall along the back will soon get covered with the hugemongous mind map! 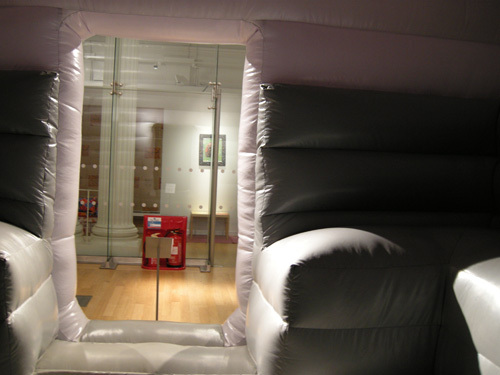 The view from inside Mungo Thomson's Skyspace Bouncehouse. Staff at the Ministry of Rules are nothing if we’re not thorough, so we also tested Mungo Thomson’s Skyspace Bouncehouse for you and we can confirm it’s *ahem* adequately bouncy. We start our investigations on Monday the 21st – see you in just over a week’s time! All good investigations need an investigation board: lots of bits of paper with ideas on pinned up with the connections shown, you know the sort of thing. So, to start off our investigation we’re going to bend the art gallery rule about not putting your own stuff up on the walls and we’re going to create a hugemongous mind map to help us think about what we’re going to investigate. The purpose of our hugemongous mind map is to get us away from the obvious ideas and dealing with some really meaty interesting ones instead. Absolutely the best way I’ve come across of doing this is the signtific lab method, so that’s what we’re going to use. Only with many more bits of paper and sticky tape! We’ll start off with a hypothetical scenario and then build chains of : “No way!”, “Yes! And…”, “Yes! But…” and “Hmmm…” across the walls of the gallery. Somewhere along the way we’ll come across ideas that we’ll want to turn into makings and doings within the gallery – these are what we’ll be working on for the rest of the week. The Ministry of Rules is currently standing-by awaiting its first assignments as part of the Play Ground exhibition at New Walk Gallery.